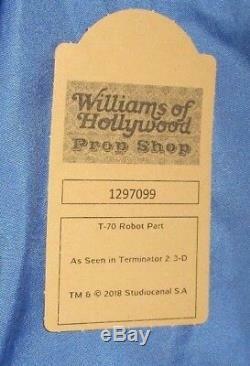 ABOUT THE ITEM: This is a very nice TERMINATOR 2 3-D T-70 robot bicep prop that was used at Universal Studios. This is one of the inner working metal parts from the bicep. 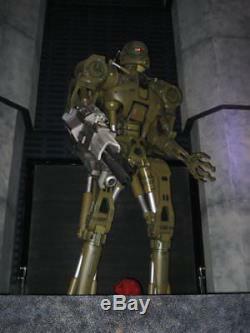 It is a piece from the extremely large T-70 robot that was used as part of their show. I don't have to tell you how cool this item is! To own a prop used by Universal Studios for their Terminator ride/show is way cool. Comes with a tag stating they were from Universal Studios and were obtained directly from Universal Studios. PLEASE understand that it could be a few days before I respond to a question. READ AT THE BOTTOM ABOUT THIS. But some depending on the location in the country will go by parcel post. The item "TERMINATOR 2 3-D Universal Studios Theme Park Movie PROP Part from a T-70" is in sale since Tuesday, September 4, 2018. This item is in the category "Entertainment Memorabilia\Movie Memorabilia\Props\Originals".